Yesterday i posted a comparison between nRelate and LinkWithin related post widgets. Today we will be looking into few easy steps by which we can add this cool plugin to our Blogger blogs by following these few steps. As i mentioned yesterday, that you can install the plugin without registering to nRelate website, but the draw back would be that you wont be able to customize the widget as per your liking. So follow the steps below including registration. Go to nRelate website and click Partner Login as shown in the picture below. Now hover over Install button and click Blogger. 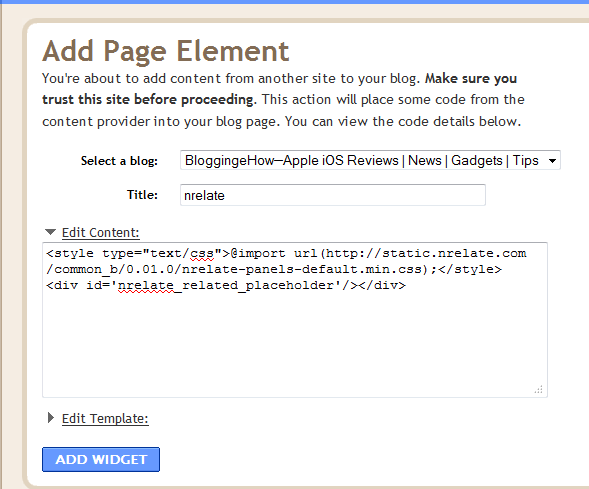 A field would appear where you have to provide you blog link where you want to add nRelate widget. Then click submit. 2. Now it would ask you whether you want to add it to your post pages only or on main blog page too. So people normally only use the related post widgets on post pages only, so thats recommended for you to do so as well. Finally it would open up a widget called Add page element. There are 2 sections. Enlarge the section that says Edit Content as shown below. You have to delete the code in orange as shown below. Click Add Widget button and its all done. :) Hope that was easy to follow. Now see, you can play with couple of settings from nRelate website. As you apply the change there, the plugin would automaticly be updated on your blog. For customization, go to Manage Tab button (after login) >> Blogger and follow up there. When you are done playing with the settings, dont forget to click save below the very page. Enjoy the new great plugin guys. NOTE: Do not copy the codes provided here in the posts as they are only for reference purpose to explain the process. Get the widget from the website as it would be used for future customizations. can u help me bro ???? As i mentioned in 2nd step of the post, that you need to delete some section of the code and then proceed with saving the widget. If its not deleted, the widget would appear below the comment section. Buddy make sure that you save the changes that you make on the nRelate customization pannel, as i mentioned in the post. My pleasure friend. Glad for you. Thank you Mohammad for the incredibly helpful, step-by-step post. We wish you and your readers a safe and happy holidays! Bro can u tell me how to place nrelate just below the post on the right hand side. As you have placed it. N how to customize it's text and color etc. ? Mine shows above the post. how to change it please. If it's okay I'd would like to ask for help, If you could see in my blog's homepage the nrelate is posted below the post/s, which does not look good since it's only a small snippet of the post. Do you have any idea on how to remove the nrelate on the homepage (summary posts) and just see them in the individual(complete) posts. Dear Hassam, I applied it to my website but I can see it at all. Can you help me please to fix this. Thank you!